Travel is a collectively favorite activity at our house, but more than destinations we crave for experiences. Memorable experiences make your life rich as it is something that gets etched on your soul. No amount of fancy amenities or fab pictures can replace the experiences that you collect. These memories are so strong that you go back to those moments just by closing your eyes. We regularly go to off-beat locations for such memories as these might not make it to best travel journals but they are definitely experiences worth enjoying. It also helps children rooted. One such memorable trip was Waynad. Waynad is a district in the north-east of Kerala. 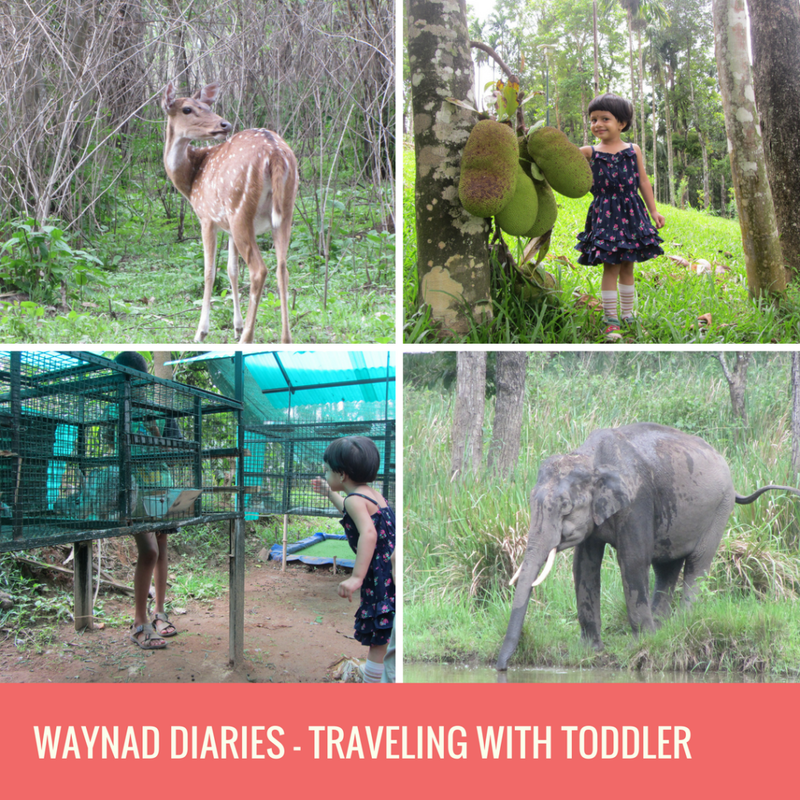 During our stay in Bangalore, we had planned a trip to Waynad, however it did not work out for some reasons, so after we moved to Pune, at the first opportunity of a long trip we decided to go to Waynad. We wanted to experience home stay during this trip, so our search was focused on Home stays in Waynad. Another cousin of ours and his family too was coming along, so we were looking for an individual house. This is when we found Waynad Blooms, and the stay was an experience in itself! We visited Waynad Blooms in 2012. That time my older kid was around 2 years old and instead of a hotel we wanted a homely atmosphere. Waynad Blooms was perfect in that sense. It is a large property and had individual villas for accommodation. We booked a 2 bedroom villa. The villas were spacious and there was enough space for both the kids to play, in and around the property. They had a common kitchen and all our meals were served there. They were accommodative about providing child friendly food which worked in our favor. Staying in a huge property amidst various plantations like beetle nut, rice, fruits and spices was a perfect way to spend time with the family and enjoy the laid back atmosphere. Waynad blooms stayed in our minds after so many years for the wonderful clean surroundings, introduction to livestock and variety of spices that my daughter enjoyed, lush greenery and great hospitality. This was the first time my daughter was experiencing living with livestock like cattle, rabbits, dogs, ducks etc. and she thoroughly enjoyed feeding them and touching them. Her favourite rhyme there was Old Mac Donald and she even deduced that the caretaker wasn’t as old as Mac. Donald! The tour in the spice garden proved fun and educational. My daughter was introduced to spices and fruits that are usually not seen in Pune and Bangalore! My daughter was thrilled to see a Jackfuit available at her height and as the caretaker showed us cardamom plants she squealed with delight when she found the elaichi beans. She was surprised to see the nutmeg plant and its various uses! The numerous varieties of flowers added to our experience. Waynad is nature’s bounty and has a lot of sightseeing options around as well. It is cooler and is a hill station. Waynad is scenic and there are a lot of attractions in and around Waynad. As we had two toddlers with us, we decided to focus on places that all of us can enjoy as a family. Banasura Sagar and Banasura hill are one of the most important attractions in Waynad. Banasura Sagar is a Dam and Banasura hill is something that offers a bird’s eye view of the backwaters and the surrounding hills. A picturesque place, the area is well maintained and is apt for spending the evening. There is a small garden, sitting area, boating and open area for kids to play. Come evening and the place turns into a mini fair. The speed boat rides are enjoyable and as the area is huge, it doesn’t feel too crowded. However when we went, toilets were a matter of concern. The views from the top of Banasura hill are breathtaking and it is something that you should not miss. Waynad Wildlife Sanctuary also known as Muthanga Wildlife Safari is the forested area between Karnataka, Kerala and Tamil Nadu. The forests are known as Bandipur and Madumalai respectively in Karnataka and TN. Being there early is important as when we went, there were enough tourists and we had to take our tickets and wait for our turn for some time. It is beneficial if you know the timings and reach in that period. As the jeeps are limited, the tickets are first come basis. During our jeep ride we saw a lot of deers, Malabar squirrels, birds like woodpecker, monkeys and lone elephant. While we were travelling, there was sudden activity on the wireless and the guards were on alert. We excitedly asked if there was a tiger sighting, but the guard simply said, no it was the elephant. We were puzzled over the hype around elephant and dared ask the guard once he had informed his details on the wireless. Pookot Lake is a serene and beautiful place that is brimming with lotus. There are boating options available and with the weather being pleasant it is a perfect outing spot. I was reminded of the Ooty lake, sans the commercialization when we went there. Children enjoyed the quiet boat ride and A was super happy showing off her color recognition skills as she named the colors of each flower that was blooming around. Our waynad trip was memorable for the carefree yet homely stay that we enjoyed at Blooms Waynad and the wonderful weather that made the stay pleasant. The best part was during our stay none of the kids or adults craved for any electronic gadgets like TV or mobile games! I would love to visit the sanctuary. Looks fun. Family travels are indeed fun and they become more exciting when the places we chose are kid friendly. Wayanad seems to be one such. I didnt visit Wayanad but your pics showing that the place is ideal to visit with kid. It will be a fun time for them. Wayanad is a new name to me. Kids friendly places puts the parents in a relaxed zone. Going to off beat places is a good idea. 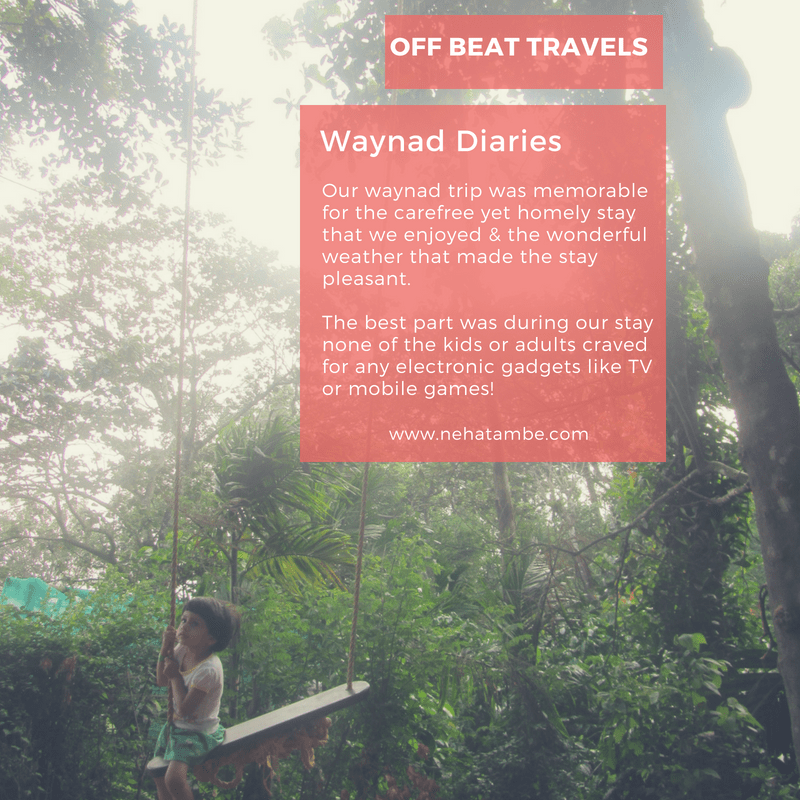 Waynad is undoubtedly a wonderful offbeat location Neha, I didn’t know about it. I really appreciate the fact you highlighted about how nearness to Mother Nature is all one needs some times. Have heard a lot about Waynad though have never been there. Thanks for giving us a virtual tour of this beautiful place through your words and pictures. Your daughter is so cute and looks like she had a great time. This place looks great. I felt I almost went there. Will bookmark for my reference. This place looks so serene and close to nature. When kids enjoy the time with animals and love to spend time in beautiful nature, We feel our trip has been successful.